'If the thing is very important to gameplay and shows even in slightest story about the game - even in shortest oneshot - it should be on 1st page'. Idea is to maximlize 1st page usability, not overbear players with needless section on first sight, etc. Lair Traits are those crucial thing. Family Ties are not so. And still Family Ties would simply be on 2nd page. Lair's Traits is much more important than Family Ties list in gameplay. When you ran oneshot game - you prepare only 1 page sheets, now full 4 page 'monsters', so new players will not be freaked out. Just see how are made official Ready Made characters. For example, I ran Beasts only sessions - that are core of game - and we dearly missed Traits. Family Ties are all good to be on second page as crossovers are encouraged, but not the heart of the system. Players all the time try to impose Traits, Family Ties can be made only when ST shows other-non Beasts monsters in story. Wait, what? Horrors Dream Form stats are not the same as human Hosts Dream Form? Are this only when Horror is Slumbering, that they are disconnected? If you want to see, here is Astral Traveler sheet for Mage on my design. I would simply used left column for Dream Forms, maybe use it once again if those are two different. 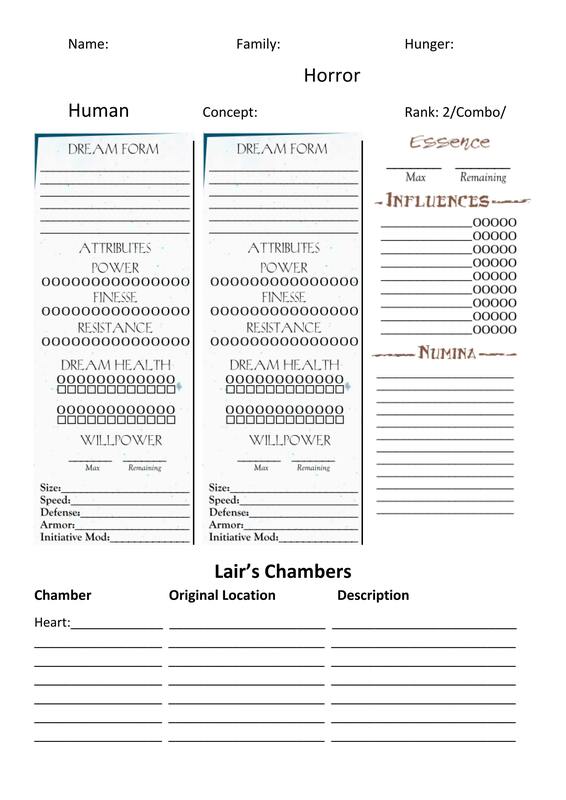 Then you can make 1st page on Dream Forms, 2nd page on Lair. Last edited by wyrdhamster; 10-01-2018, 12:58 AM. wyrdhamster No, Horror Form is much more potent. For one, they take the highest of their power/manipulation/resistance attributes as their base. Then, you get to spend 2 x Lair on Attributes in addition. So horror Form is quite powerful. wyrdhamster No, Horror Form is much more potent. For one, they take the highest of their power/manipulation/resistance attributes as their base. Then, you get to spend 2 x Lair on Attributes in addition. Once spent those 2 x Lair Attributes dots are set in stone, yes? They do not change on each visit to Lair, or something? They only can be added if you rise Lair? With Beast's Players Guide Merit like Legendary Horror maybe it's good thing to also add Rank, Influences, Numina and Essence small sections to Horror's Sheet? It's not that all Beast have those, but once you have, it's useful to have them. If going with adding Ephemeral Entity stuff to Horror Sheet, I would based it on my Spirits-Totem one for 2E Werewolf. Later today I prepare mock sketch of it, so you can discuss usability of it here. This is first draft of Beast's Horror Sheet ( with Human Dream Form section ). Fonts and borders will be changed in final version. Idea is to make 2 page Horror & Lair Sheet. with 1st page made by my and adding Lair Sheet as 2nd page. As you can see, I added also Lair's Chamber list with pointing on what locations they are based to easy track them on bottom. Rest of fan sheets just let you paint configurations of Chambers, not listing the Chambers themselves. If you like this - write a comment. If you have better idea what should be on the bottom of Horror Sheet - I'm all ears. I need to know when sheet idea is approved to send to Mr Gone. Last edited by wyrdhamster; 10-01-2018, 03:23 AM. I like this, but it would be nice to have more room to describe what Traits are active 'by default' in a specific Chamber, though IU suppose it could just go in the description field. wyrdhamster For one, they take the highest of their power/manipulation/resistance attributes as their base. Beasts do this in their Dream Form, too, I believe. The only differences are the free attribute dots from Lair, and any bonuses from Legendary Horror (both of which are still very significant). Last edited by lnodiv; 10-01-2018, 08:41 PM. Beast's do this in their Dream Form, too, I believe. The Horror being what it is, combined with the fact that the bonus Lair dots weren't part of the Horror's form in the initial draft and the Begotten's general tendency to treat exploring the Astral as more of a specialized pursuit, inclines me to think otherwise — it's hard to claim the minimal extra power of Being A Dragon when your self-image is still just as human as it is in the material world. Can Traits be active on default in each Chamber, separately? A Beast's Chambers can be subject to any combination of their Lair Traits at any time, and the Beast can choose to exclude individual guests from those Traits' effects without turning them off entirely. Last edited by Satchel; 10-01-2018, 09:18 AM. Yeah, I was mis-remembering the section, thinking that particular part was in the Dream Form section and not the Horror sidebar. And to clarify what I mean about 'default' traits: I've had plenty of Makara, for example, that don't necessarily manifest Suffocating (to represent absolute flooding) in all of their Chambers, reserving it for only a few. As Beast newbie - Do Human Dream Form use highest in Power, Finesse and Resistant category - or not? Or maybe highest of two Attributes in those categories, like mages do? From how I read BtP corebook - Each not taken Chamber X in Primordial Dream has Trait Z ( like, for example, Burning Trait for the Volcano place ). Then comes Beast with Traits A & B already and as she has rise Lair Rating - she can take Chamber X to add to Lair. From there Beast can always invoke Traits A, B & Z, however, on default, each Chamber X scene still starts from Trait Z each scene with it. Because, you know, Lava in Volcano is Burning on general. Last edited by wyrdhamster; 10-02-2018, 12:38 AM. It's explicitly just the Mental Attributes for regular humans and most other supernatural beings. It says this in the section that talks about Dream Form on page 99. Okay, wording on Horror's traits seems to imply that Beast ( as only human host ) uses rules for humans. A Beast’s Horror has a much larger, more potent presence within the Primordial Dream than others. The Horror uses the highest of the Beast’s Strength, Presence,or Intelligence as Power; Dexterity, Manipulation, or Wits as Finesse; and Stamina, Composure, or Resolve as Resistance. From there Beast can always invoke Traits A, B & Z, however, on default, each Chamber X scene still starts from Trait Z each scene with it. Because, you know, Lava in Volcano is Burning on general. Beasts have absolute control over what Lair traits manifest in any given Chamber of their Lair, though - so it follows that if they want whatever it's 'native' trait is on or off by default, it will be. If they want a trait to be active in a Chamber forever, it will be. If they don't want it active in a Chamber ever, it won't be. The freedom to invoke traits in their Lair also extends to not invoking them. Oh yea! I do have one of those. Have to see what I can do sometime.